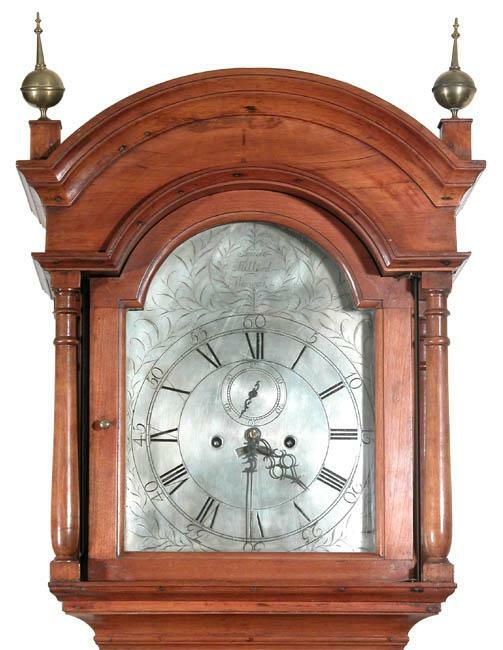 This is a tall country clock was produced by Squire Millard, whose listing indicates he fought in the revolutionary war. 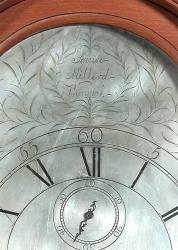 The dial is a beautifully-engraved silver over brass, and indicates Millard resided in Warwick, which is about 10 miles South of Providence, RI. The cherry has turned a beautiful lemon yellow/brown, and movement and case are original in every way. 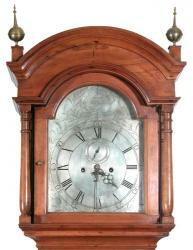 This clock came out of a local Rhode Island estate auction. Above items from Smith's "Civil & Military Lists" vol. I pp.394, 391 & 406 respectively. 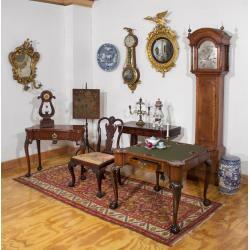 Last two items listed under "Squire Willard". Millerd is buried in a private graveyard in back of Millerd homestead in Cowesett. House is on west side of main highway with wellcurb on porch gavestone marked: "In memory of squire Millerd, Esq., who departed this life Jan. 2d A.D. 1820 in the 70th year of his age. He steadfastly held to the faith, and died in the hope of a blessed immortality." On gravestone next to it: "In memory of Mrs. Patience Millerd, wife of Squire Millerd, Esq., who died Feb.14, 1830 in the 85th year of her age." Height: 88 1/2 in. Width: 20 in. Depth: 11 in.